Thermal bridges can short-circuit the best-laid plans for building envelopes. They rob buildings of comfort and efficiency. 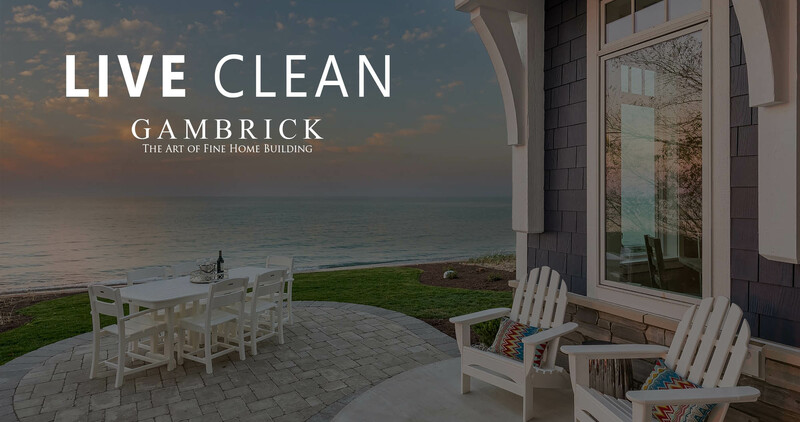 And because their cold influence can introduce condensation into the inner recesses of assemblies, thermal bridges can cause mold, rot, and building failure. Insulated, solid concrete foundations and walls which provides a wall R value of R 36. Typical CMU or poured concrete walls only have an R value of between 8 and 12. They’re great at minimizing thermal bridges since their well insulated and totally solid. With no penetrations through the building envelope. Energy Efficient. Independent testing proves ICFs deliver 58% more R-value than traditional wood framed cavity walls and eliminate thermal bridges. While thermal bridges don’t have a huge effect on poorly insulated buildings, as buildings get more and more insulated, the weak link of thermal bridging becomes more pronounced, as does the impact on building performance, comfort, and durability. 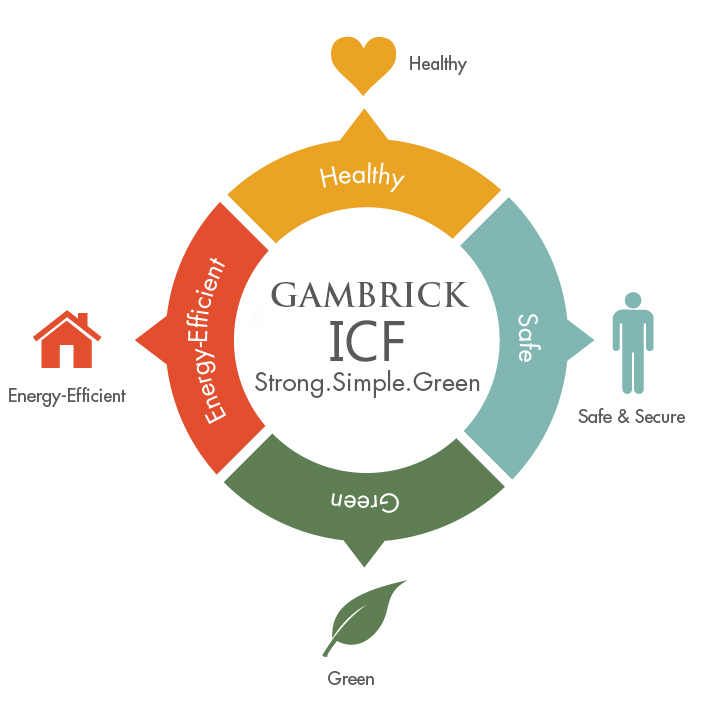 ICF construction eliminates the majority of these problems. 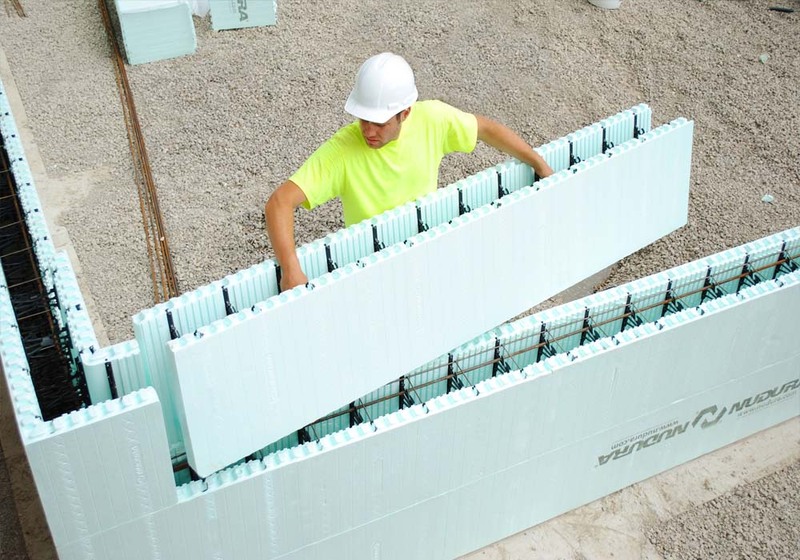 Insulating Concrete Forms (ICFs) are hollow foam blocks or large foam panels which are stacked into the shape of the exterior walls of a building, reinforced with steel rebar, and then filled with concrete. 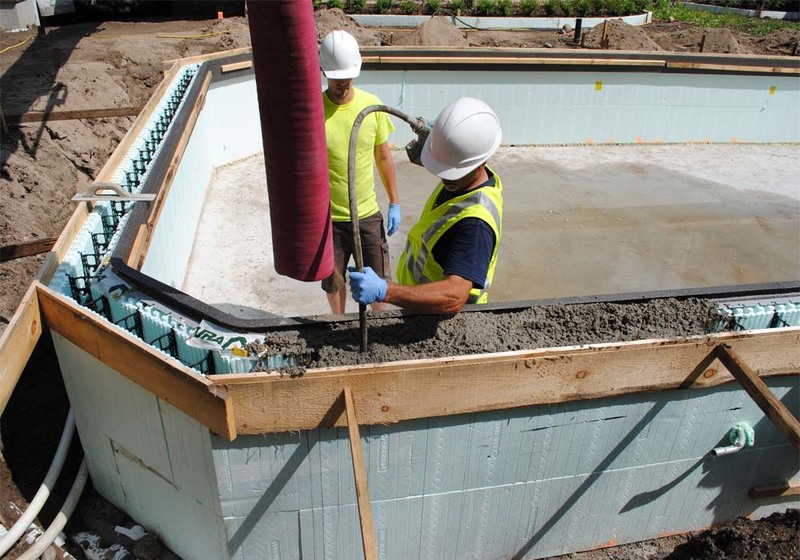 Insulating concrete forms combine one of the finest insulating materials, Expanded Polystyrene (EPS), with one of the strongest structural building materials, steel reinforced concrete. The result is a wall system of unmatched comfort, energy efficiency, strength and noise reduction. The best insulation in the world won’t get you anywhere if you ignore thermal bridges. Thermal energy seeks the path of least resistance, and common building elements like concrete slabs and steel plates can serve as a virtual highway for escaping energy, an easy detour around even the thickest of insulation. 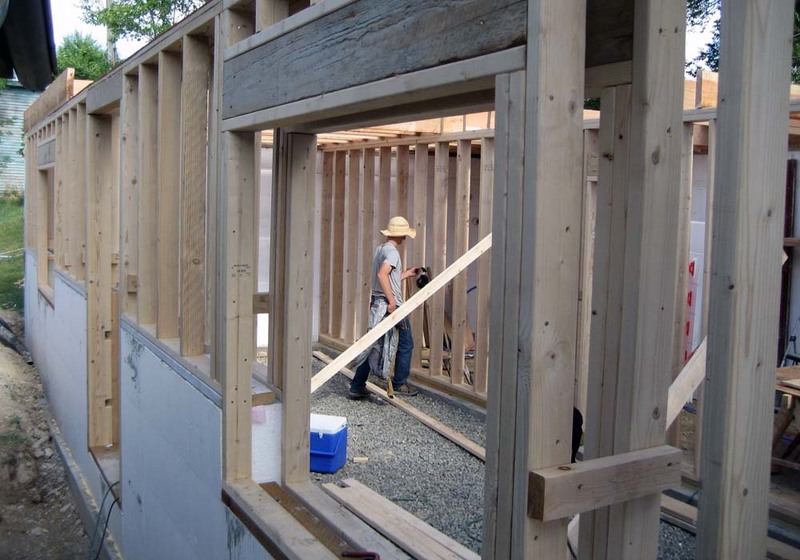 Double stud walls are 2 separate exterior walls framed parallel to each other with a space between them. One of the walls is the structural wall and the other is used to increase wall depth. Insulation can now flow between the walls, reducing thermal bridging to the point where it doesn’t have much effect on overall performance. A deeper the wall cavity means more room for insulation. 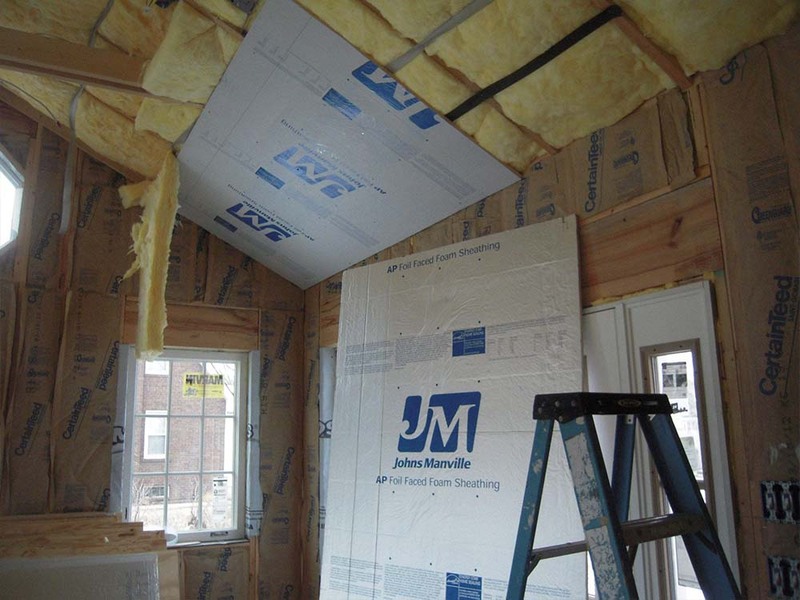 More insulation means a more stable interior temperature throughout the year. The space between walls essentially breaks the thermal bridge by creating what’s called a thermal break. Heat that would normally escape by traveling through the walls studs is stopped by the insulation inside the wall. The exterior wall cavities of a super insulated house are 12 inches thick. Filled with dense pack cellulose insulation to achieve R-44. The walls of a house built to Passive House standards are 16 inches deep. These can achieve R-60 if filled with dense pack cellulose. Larsen trusses are non-structural. These lightweight trusses are tacked onto the sheathing after a house is framed and sheathed. 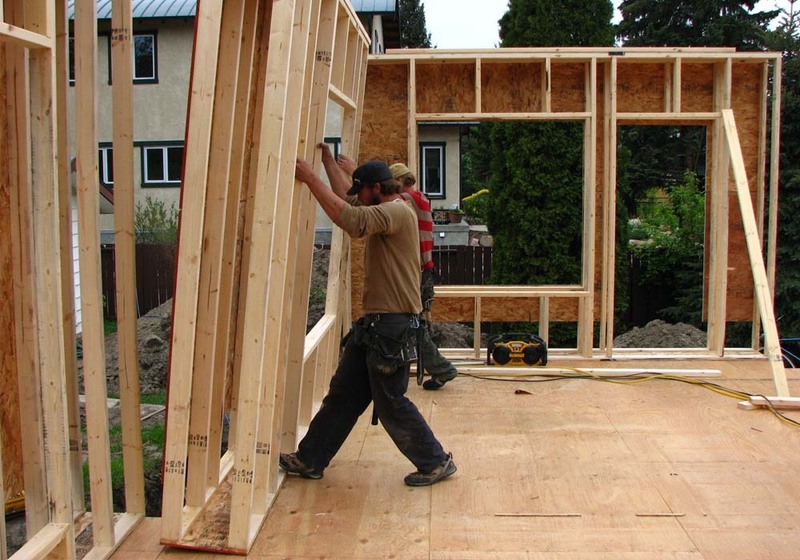 In most cases, exterior 2×4 or 2×6 walls are built, sheathed and the roof is framed. Then Larsen Trusses are installed. Larson Trusses are used to build thick walls. Thick enough to provide room for above average amounts of insulation. But they’re not structural. They’re light weight and are used just to provide an additional cavity to stuff insulation into. They were developed in 1981 by John Larsen, a builder in Edmonton, Alberta. 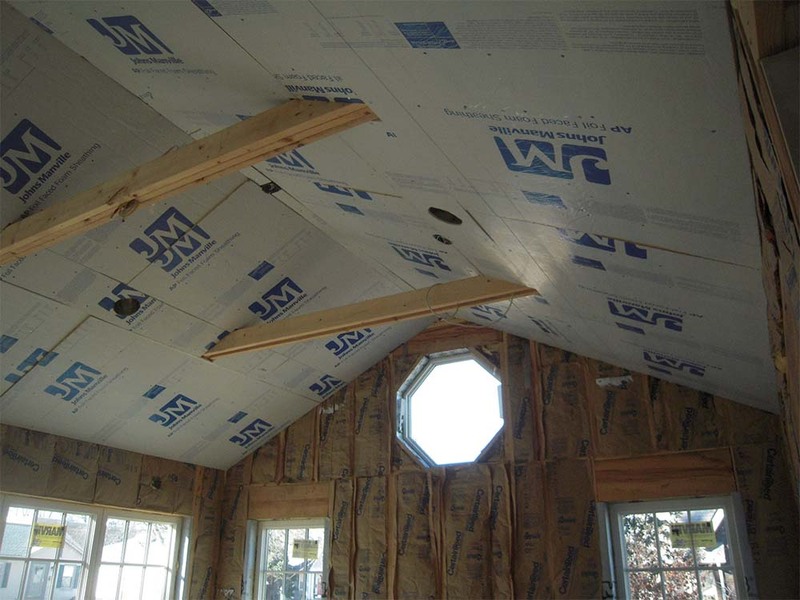 Adding Larson Trusses to a new or existing home is a great way to add additional insulation and eliminate thermal bridges. Many builders confuse Larsen trusses with wall trusses. If a truss is designed to support the roof load, it’s not a Larsen truss. It’s a wall truss. For example, with double stud walls one of the two walls supports the roof load. This would make it part of a wall truss. Larsen trusses are installed on the outside of the wall sheathing. In most cases, after the trusses are installed, you then install another layer of sheathing on the outside of the trusses. A double stud wall only has one layer of sheathing. Larson trusses are light weight and non structural. 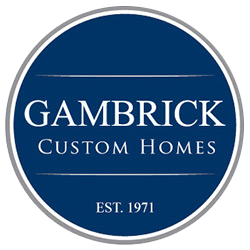 They’re designed to create a cavity to hold additional insulation and eliminate the thermal bridge. They’re never structural. They work great when retrofitting or remodeling an older home to Passive Home or LEED energy standards since they can be built and installed on the outside of just about any home. A common mistake in the building industry is to assume that a wall’s thermal resistance or R-value is equal to that of the insulation it contains. Consider a super-insulated example: a 15” thick wall full of cellulose insulation. 15” of cellulose insulation has a value R-50, so by definition the wall must be R-50, too. Right? No. We have to look at the thermal resistance of the wall in assembly. How is the wall constructed? Do any of its components reduce thermal resistance or create thermal bridges? A standard wood frame wall, for instance, contains roughly 25% wood studs, leaving 75% for insulation cavity. And though wood isn’t particularly conductive, each of those studs is a thermal bridge, particularly when compared to R-50 insulation. The wood in a wood frame/cellulose insulation assembly drops the R-Value from R-50 to R-32, allowing 58% more heat loss than an R-50 cellulose monolith. Note the chart below. If we move to a more conductive material, like concrete, then the impact of thermal bridging becomes more dramatic. A 6” concrete beam cutting across a 10’x10’ wall of R-50 cellulose will drop that assembly to just R-13. The concrete makes up just 5% of the assembly but leads to 293% more heat loss. And the effect of a steel thermal bridge is crazy. 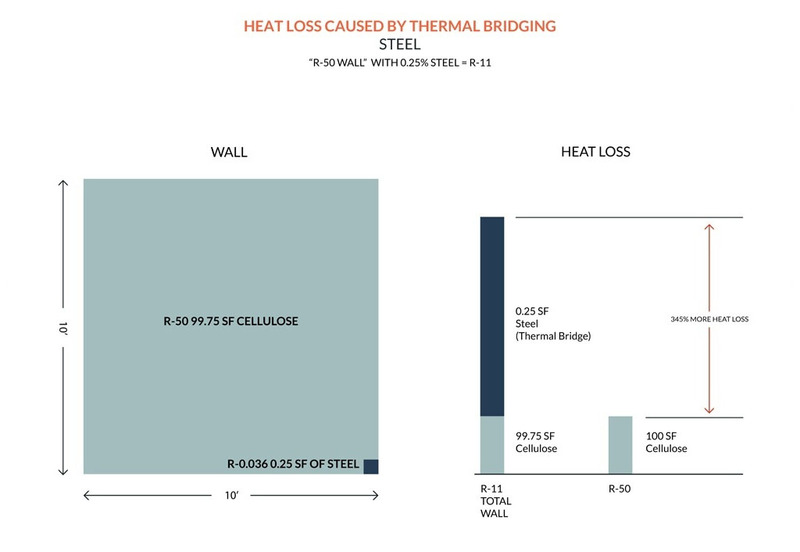 Our back of the envelope analysis shows that a 6”x6” piece of steel – just 0.25sf – that penetrates a 100sf R-50 cellulose wall will drop the assembly’s thermal resistance to just R-11. In this example the steel makes up just a quarter of one percent of the total wall assembly but causes 345% more heat loss. So, mind those thermal bridges because they can wreak havoc with your building’s performance and durability. We start by carefully detailing buildings to minimize thermal bridging in the first place, through advanced framing, carefully detailing junctions, no un-insulated concrete or metal penetrations of the thermal envelope, and more. We then wrap our high performance buildings with continuous insulation to break any remaining bridges. A thermal break occurs when an insulator interrupts the thermal conductivity in a material. “Thermal bridging” is the pathway in which heat travels out of your home, a weak point or cold spot in the thermal envelope. Like the stud in a wall. A stud can have great insulation on either side of it but heat can still be lost by traveling through the stud. The stud is known as a thermal bridge. A great example of a thermal break is the insulation between a double stud wall. Heat travels through the 1st stud but stops when it hits the insulation. This is a thermal break. By breaking the thermal bridge heat can’t escape the home and is turned back in. Cold window and door frames are great at losing heat by creating thermal bridges. These bridges can come in the form of un-insulated glass or frames. That’s why in Passive House construction we use triple pane glass with insulated fiberglass frames. Not only does this increase insulation levels but it also helps to stop thermal bridging. So, thermal breaks are good, a key component of avoiding thermal bridges. Below we see 3 examples of thermal breaks. A layer of rigid foam insulation is installed between the sheet rock and rafters. 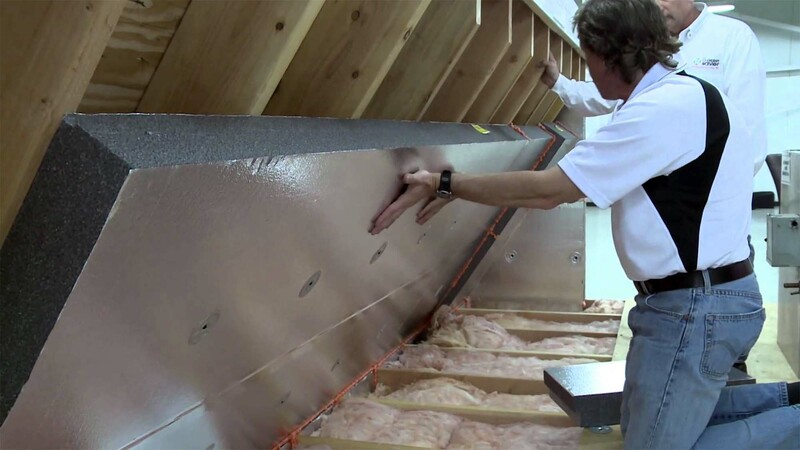 This layer prevents heat from using the rafters as a thermal bridge. Thermal bridging is an the easy pathway for heat to flow across a thermal barrier; in other words, a weak point or cold spot in the thermal envelope. A good example of this concept is the concrete sub floor. Concrete is a good conductor of heat. Warmth absorbed in a concrete floor can easily escapes through an uninsulated perimeter. Creating a thermal break by fully insulating the concrete sub floor can retain up to 90% of heat. Otherwise, that heat is transferred to the exterior through the thermal bridge. The temperature difference between internal and external occurs at the joint between wall and floor. This difference in temperature can create an area where condensation forms, resulting in mold or mildew growth. This is why in Passive House construction we not only insulated the foundation walls but also install 6 – 8 inches of rigid foam insulation beneath the entire slab. We also install vapor barriors and seal all penetrations to prevent thermal bridging and moisture. There are two main types of thermal bridges, known as geometric and construction. Geometric thermal bridging is hard to avoid. However, it’s important to note that geometric thermal bridging increases as the buildings form becomes more complex. This is why simple shaped homes generally are more energy efficient than complex ones. As a home builder, we don’t spend much time thinking about geometric thermal bridges. Most of this is out of our hands. 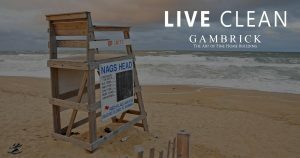 These issues are generally left for architects and engineers to hash out when designing although we do like to bring up the issue during the design phase. Rafters that pass through the thermal envelope to support the eaves or for aesthetics. Cantilevered structures passing through the thermal envelope. Construction thermal bridges can usually be avoided or minimized with careful design. Any construction thermal bridge that does occur will contribute a measurable heat loss. For Passive buildings, the heat loss from any construction thermal bridge must be calculated and accounted for. In many cases, geometric thermal bridges also include an element of construction thermal bridging. For example, an external wall corner which may act as a geometric thermal bridge can have studs inside also acting as a construction thermal bridge. If the design is final you can’t fix the geometric issue. But the construction thermal bridge can be easily dealt with through the installation of a thermal break. In any building, even those built to Passive House standards, some thermal bridging is unavoidable. However, good design and construction can minimize the number and effect of thermal bridges. Thermal bridges aren’t a big issue in poorly insulated homes. Heat is being sucked out on a constant basis through a number of different areas like poorly insulated windows and doors, drafts, cracks, etc. With heat escaping so easily all over the place it doesn’t really make it’s way to the thermal bridge. However, with a high-performance thermal envelope, thermal bridging is critical. When the building heat loss is very low, thermal bridging can contribute a significant proportion of it. Remember heat wants to escape to the colder outdoor air, it’s drawn to it. If it has no easy way to get out it eventually works it’s way across any thermal bridge it can find. If this is the only way heat can escape then it can become a big problem. Where heat escapes through a thermal bridge, the internal surface temperature will drop, creating a cold spot. The surface relative humidity will thereby increase. This introduces the risk of condensation on the internal surfaces, which may lead to mold growth. This can be unsightly and a health risk to the people in the building. While thermal bridges can cause internal cold spots, they can equally cause cold spots within the building fabric. The same issues arise – a drop in temperature and an increase in relative humidity. In this case, the risk is interstitial condensation, mold within the building fabric and potential damage to elements of the building fabric. Over a long period, the damage can be considerable. Cold spots are uncomfortable to be near and can cause drafts. If condensation occurs, or even worse mold, the indoor air quality will suffer, along with the people breathing it. Moisture and mold can both lead to health problems for the people in the building. 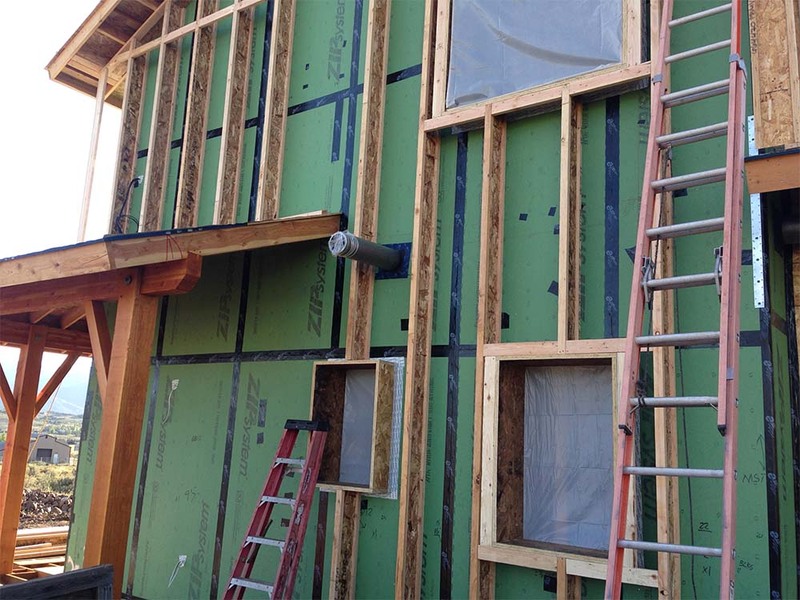 The Passive House thermal envelope should be continuous. The insulation should pass the pen-test in every drawing. However, neither of these guarantees thermal bridge free construction. 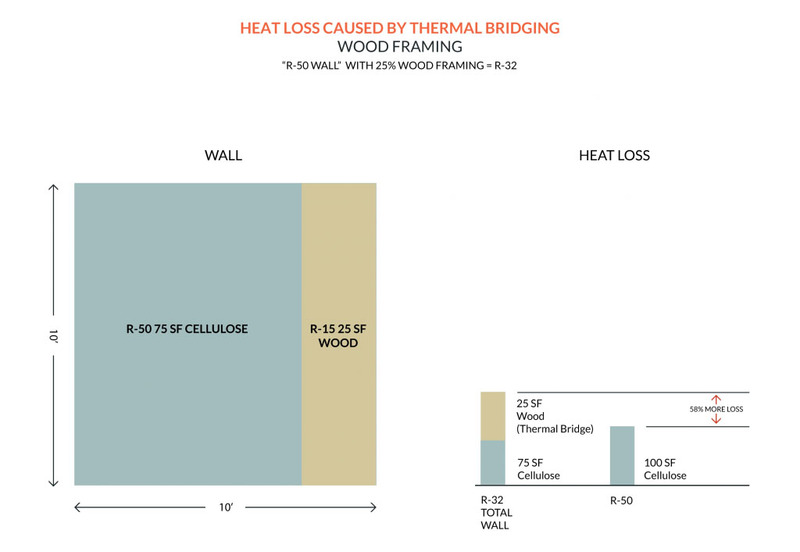 For the Passive House Standard, thermal bridge free construction is where calculating the heat loss from all thermal bridges doesn’t increase the overall building heat loss calculation. This is possible even with some thermal bridging, such as unavoidable geometric thermal bridges, because the Passive House Planning Package (PHPP) slightly overestimates the building heat loss. The slight overestimation ensures PHPP calculations are conservative rather than optimistic and therefore very reliable. Calculating all the thermal bridges of a building would be very difficult. Instead, the Passive House Standard takes a pragmatic approach. I won’t get into the exact methods the Passive House Standard uses to calculate thermal bridge heat loss. For that you should contact a professional or download the PHPP guide book. For the average homeowner or builder not interested in building to Passive House Standards. Simply dealing with the construction thermal bridging by using better windows, more insulation, and thermal breaks is a huge step forward and will save you a lot of money in the long run. If thermal continuity has been considered from the outset, it’s possible to achieve thermal bridge free construction. If it hasn’t been considered, or other factors influence the design, then each thermal bridge needs close consideration. 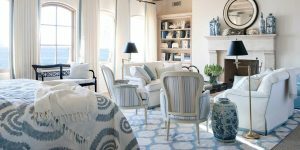 Some can be easily minimized or eliminated through careful detailing. Others might require expensive and complex thermal break components and detailing. Passive House thermal bridge free construction is achievable with careful and early consideration of thermal envelope continuity. The Passive House Standard requires thermal bridge free construction in order to deliver what it promises. Incredible energy efficiency and exceptional comfort. Thermal bridges can have a serious impact on the energy efficiency and comfort of high-performance buildings. They also increase a number of undesirable risks than can damage the building fabric. 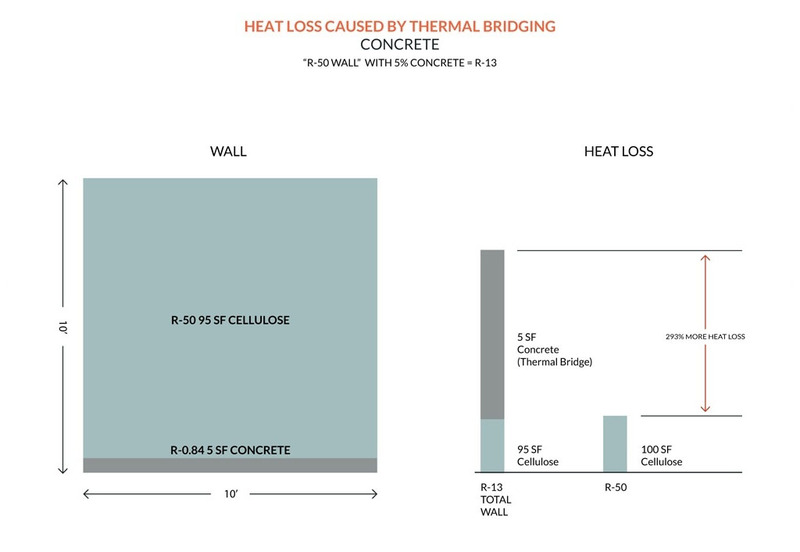 Thermal bridge free construction minimizes or eliminates these risks. Thermal bridge free construction ensures a consistent high quality thermal envelope that is robust and long lasting. Early consideration of the thermal envelope can eliminate critical thermal bridges by design. Thermal bridging is an area where architects and designers can be empowered to influence energy efficiency and cost, as well as comfort and durability. Thermal bridges increase heat loss and therefore heating costs. In the long run eliminating them will save you money. Ever Consider Building A Passive House?